There’s a new game at our place – we call it ‘garage ball’. What you need – one opened garage door, one soccer ball and at least two players. 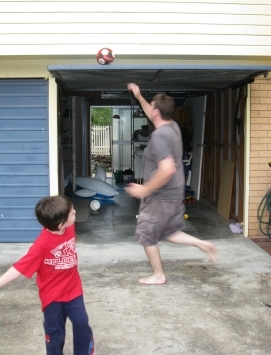 It is a little like basketball but the object of the game is to get the ball up onto the garage ball. One day we’ll actually put the basketball hoop up. Until then we’ll enjoy annoying the neighbours with the sound of the ball coming down on the metal door. This entry was posted in 365 Day Photo Challenge, Photography and tagged garage ball by Jodi Cleghorn. Bookmark the permalink.